Imagine a perfect combination of … breathing ... movement … & music flowing as one … your breathing is deep, calm & optimized, your cells are infused with extra levels of oxygen, your body is deeply immersed in powerful dynamic moves ... while beautiful music soudscapes sway you deep into the state of Flow. Imagine you are completely dissolved in what you are doing, so much so it feels like time is slowing down. In this state there is no doubt, there are no stresses or fears, there is no inner voice criticizing. This state is not elusive, this is the state that you can actually experience … this is the state of Nirvana ... the state where everything just flows. Achieve a super efficient flow of the body & mind with the world’s most comprehensive breathwork system that uses a powerful combination of breathing techniques, music with inbuilt thetawave technology & functional movements, elegantly woven into simple and effective Nirvana choreography programs. World class experts on breathing, kinesiology & flow states & based on years of research, have developed a cutting edge Body & Mind system that includes a science based implementation of deep flow states & powerful breathing optimization system to efficiently balance your body & mind into the optimal state. Nirvana represents the next step in the evolution of body & mind systems. Flow is a state in which the person performing an activity is fully immersed, experiencing the feeling of energized focus, complete involvement and deep enjoyment. The state of flow, or being "in the zone”, is the ultimate state, the most desirable state you want to be in ... it is the foundation for deep inner peace & sense of empowerment. While practicing Nirvana, our brainwaves are directed toward the Alpha-theta wave bridge, which creates conditions for entering the flow state. You need to deactivate first, empty the full glass to become more present & activated into the optimal state. And Nirvana does just that. Nirvana is an effective antidote for overcrowded & unproductive thoughts that clutter every second of our existence, for removing self defeating inner critic dialogue and learning how to downregulate the fast paced reality we are all experiencing. By entering the flow state, we experience what is called a transient hypofrontality. Transient, meaning temporary, hypo is the opposite of hyper, meaning to slow down or to deactivate. And frontality is the prefrontal cortex. Meaning, we deactivate to fully activate. These areas in the prefrontal cortex that are shut down, are the seats of cognitive processing, where we distinguish the difference between self and other, our sense of time, our internal dialogue. Nirvana is an ultimate Body & Mind system that uses all possible channels and proven effective interventions to facilitate the state of flow with specific focus on breathing techniques and flow of movement. If you’ve ever felt overwhelmed – like there isn’t enough time in the day to accomplish everything you want – then you know exactly what it feels like to exceed your mental bandwidth.Your focus is short, your decision-making abilities go out the window, and a list of unfinished projects begins to pile up. The processing capacity of the conscious mind has been estimated (by Mihaly Csikszentmihalyi) at 120 bits per second. That bandwidth, or window, is the speed limit for the traffic of information we can pay conscious attention to at any given time. We’ve created a world with 300 exabytes of human-made information. Today, each of us individually generates more information than ever before in human history. Our world is now awash in an unprecedented volume of data. Average human processes five times as much information as 30 years ago. The trouble is, our brains haven’t evolved to be able to process it all. "Bandwidth,” or the capacity of the brain’s ability to perform basic functions that underlie both higher-order behavior and decision-making. When bandwidth is taxed, there’s less of it available for use in other judgements or decisions, leading to some potentially undesirable choices. It’s about how much can you take on before you start running out of steam. 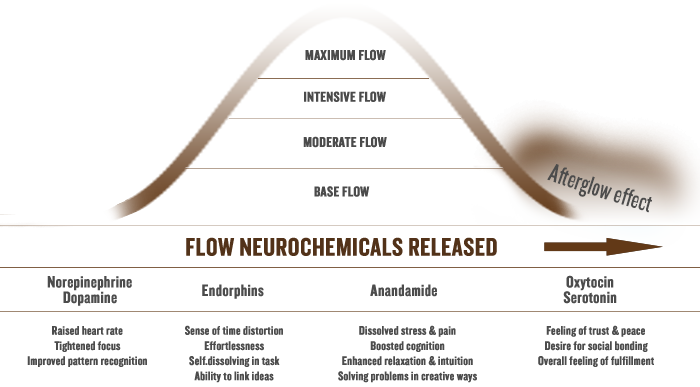 Nirvana® facilitates release of so called Flow state neurochemicals that produce direct effects of calmness & focus while also contributing to the "afterglow” effect, an experience of a long term, lasting fulfillment. Nirvana effectively produces the experience of flow states through a unique blend of interventions with mind blowing array of health & mental benefits, increasing your focus & deep presence & giving you tools to perform better mentally & physically at all levels. 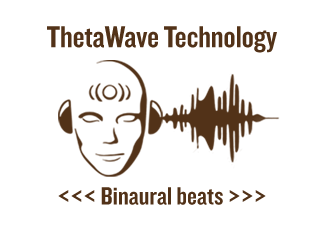 Experience the feeling of Nirvana by letting the flow of rhythmic breathing & movement to music with sound cues & thetawave technology lead you to the state of flow. Nirvana® Breathing optimization system aids in removing causes of almost all modern chronic diseases by optimizing O2/CO2 gas exchange & infusing your cells with extra levels of oxygen with one simple act: breathing right. A team of scientists including exercise, breathing & sound specialists have come up with a super effective & elegant solution to tackle a vast number of conditions all linked to insufficient cell oxygenation. Treating symptoms proves futile ... we must treat the root cause! of what the most important health index is. It is not your % of your body fat, it is not your BMI, nor will your heart rate monitor reveal what's really going on in your cells. It’s all about optimal cell oxygenation. Nirvana normalizes breathing and creates conditions in your body for it to be able to regenerate and heal itself. By this it aids to avert modern chronic conditions arising from stress followed by insufficient cell oxygenation. Nirvana does not treat symptoms ... instead it solves the problem at its root. Science tells us that well over 80% of population is breathing wrong ... shallow and inefficient ... producing toxic waste products and further promoting dysfunction on a cellular level. Ultra fast paced & unhealthy modern lifestyle ... slowly & through time ... deteriorates our breathing habits into rapid shallow chest breathing. This means we are overbreathing! 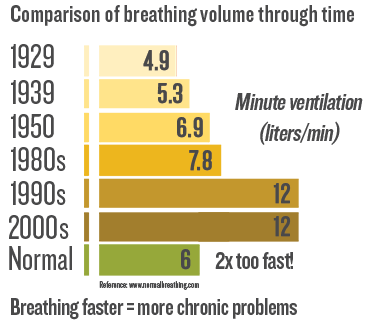 ... instead of optimal 6 breaths we are pulling anywhere from 16 to 20 breaths per minute, while poor breathing technique further decreases overall breathing efficiency. Overbreathing causes disbalance in oxygen/carbon dioxide gas exchange ... depriving your cells of the needed oxygen and precious energy ... and this in effect makes your cells sick ... makes you sick. Studies show that we are breathing faster and less efficient each year! These are just a few alarming symptoms indicating that modern civilization has pushed us over the limits of our capacity ... by imposing permanent and perpetuating anxiety & stress that results in high levels of a systemic toxicity and burnout. 80% of population is under permanent toxic stress which is one of the leading causes for many modern chronic diseases. Here is the alarming statistics that proves we have reached our limits! insufficient cell oxygenation or cell hypoxia. We can agree that health of every cell is vital for our survival. Scientists are unanimous in agreement that proper oxygenation is one of the most crucial elements of the health of our cells. And healthy cells mean a healthy body as well as a healthy mind. Your health starts at the level of every cell in your body! And there is a simple way to achieve that: just by breathing correctly! The most important aspect of mental and physical health and well-being is the respiratory process. Oxygen is absolutely essential for all human function. In fact, the primary homeostatic mechanism in the human body is designedaround necessitating appropriate cellular oxygenation. The respiratory and cardiovascular systems provide and properly distribute oxygen to the cellular mitochondria where it serves as the terminal electron acceptor in the oxydative phosphorylation process and the formation of cellular ATP. All human performance, energy, and function is based on appropriate tissue oxygenation. Any disturbance of this supply can be life threatening. The world famous Dr. Arthur Guyton theorized that all chronic pain, suffering and diseases are caused from a lack of oxygen at the cellular level. Lack of cellular oxygen is termed hypoxia. Hypoxia has been implicated in central nervous system pathology in a number of disorders including cancer, heart disease, stroke, and various other neuro-degenerative diseases. Among other diseases, regions of low oxygen tension are commonly found in malignant tumors and are associated with increased frequency of tumor invasion and metastasis. Shallow chest breaths penetrate only into the upper portion of the chest and lungs. This reduces your bodies’ ability to effectively oxygenate. This is appropriate in order to increase respiratory rate when you are under truly stressful situations, like being chased by a lion or sprinting on a track. However, when it continues for an extended period of time it sets up the pathological processes. A long-term study found that lung function predicts mortality rates. Dr. Schunemann explains, "The lung is a primary defense organ against environmental toxins. An impaired pulmonary function leads to decreased tolerance against these toxins. Dr. Wendell Hendricks, (Two-time Nobel Laureate, Winner of the Nobel Prize for Cancer Research, Hendricks Research Foundation) said, "Cancer is a condition within the body where the oxidation has become so depleted that the body cells have degenerated beyond physiological control. Several studies have shown that heart disease, depression, anxiety, and chronic pain patients have an intimate relationship with persistent shallow, chest breathing behaviors. Many researchers have suggested posture and breathing habits to be the most important factor in health and energy promotion. Proper breathing in addition pumps cerebro-spinal fluid (the fluid around the spinal cord), which results in an increase in brain metabolism and the resulting feelings of physical and mental well-being and enhanced mental alertness. The body responds to this stimulus by relaxing, understanding that it is not in a life-threatening situation (obviously if you are breathing long, slow, deep breaths you are not being chased by a lion). The parasympathetic nervous system is activated, calming stress hormones, decreasing heart rate and blood pressure. System will teach you how to breathe correctly, leading you to a slower and deeper daily breathing pattern (diaphragmatic with prolonged exhalation) that will replace shallow & stressful "default” breathing. 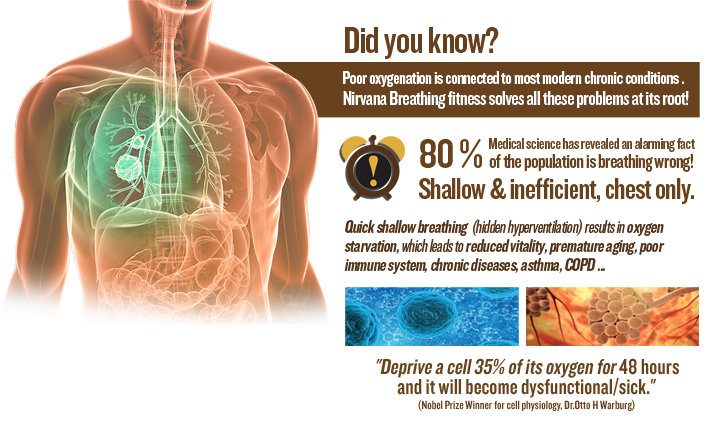 Nirvana® progressively slows down breathing rhythm going from 12 breaths/min to only 4 breaths/min. This increasingly employs the relax centers in your nervous system and efficiently slows and calms all the body systems, creating potential for regeneration through decreasing metabolic rate at all levels. Nirvana® is an ultimate body & mind detox system. Breathing is the only bodily rhythm that we are able to consciously control. Breathing is our gateway to monitor and manipulate ourselves into calmer state of body & mind. 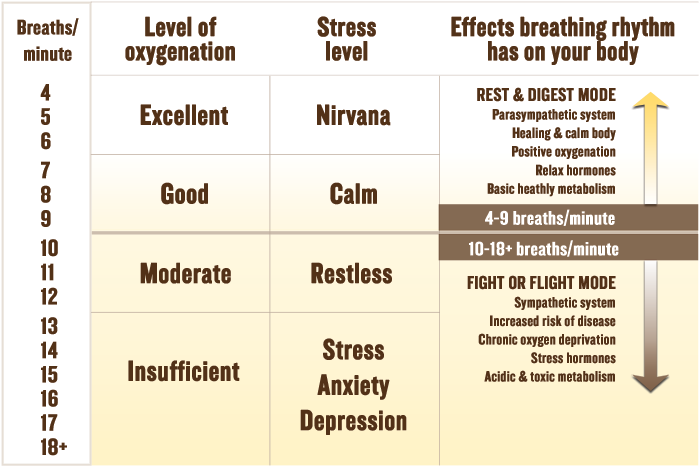 Breathing techniques used in Nirvana® are used & recommended by experts worldwide with effects well documented within science. Nirvana® has proven great results in improving body cell oxygenation levels and conditioning breathing pattern to a healthy & recommended deep exhale diaphragmatic breathing. get healthy and get in shape. What more could you wish for. Achieve a blissful calm through conscious mindful breathing & Nirvana ThetaWave sound technology. Breathing is the only bodily rhythm that we are able consciously control and is a proven gateway into calmer state of body & mind. Nirvana sequences are built around progressively slowing down breathing patterns. System uses deep "Feel good” chillout music with Nirvana ThetaWave technology & breathing sound cues telling you exactly how to breathe at which point in an exercise flow, which directly influences your relax centers. Permanent chronic stress and negative emotions deteriorate our breathing habits into rapid shallow chest breathing. This in effect produces additional toxic waste products, promoting a wide range of pulmonary & other diseases in our bodies and depression for our mind, contributing to an ever more widely present "burnout syndrome”. Beside powerful breathing techniques, Nirvana uses a wide range of other proven tools to efficiently cut you away from vicious cycle of stress, taking you from fight or flight mode and sway you into healthy regenerative mode. And on top of all Nirvana gives you a great functional whole body workout and ability to effectively control weight.